so grab that wine glass or coffee cup and settle in for a bit. My kitchen is truly the heart of my home. 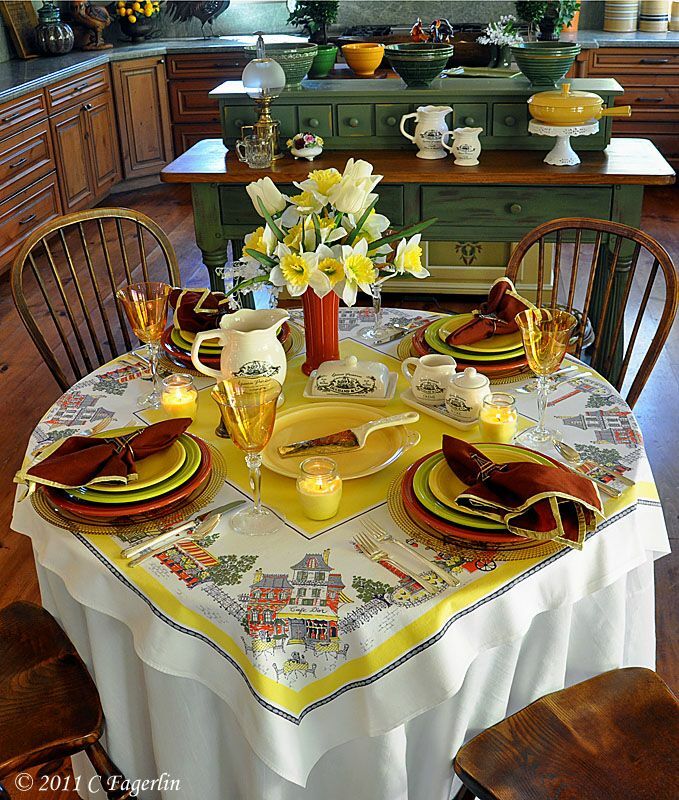 If you are a regular visitor to The Little Round Table, you are probably truly tired of seeing my kitchen! No??? 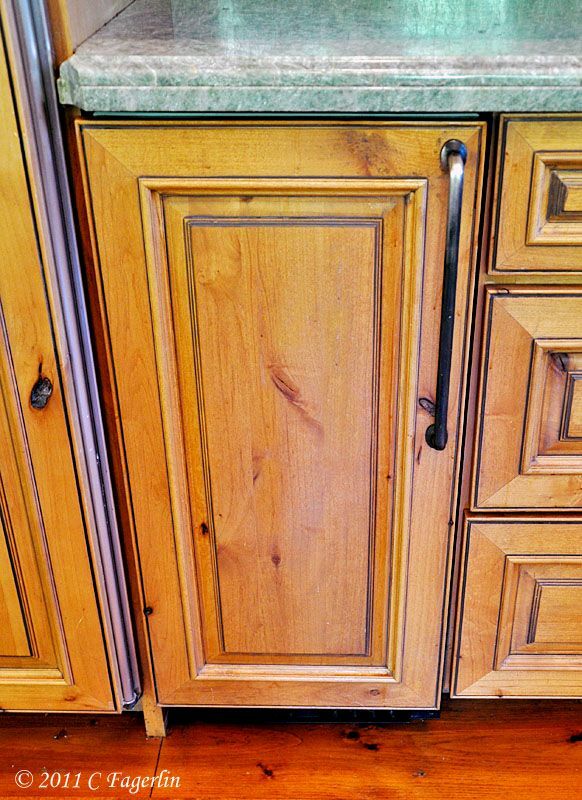 Well then, a few pictures of parts of the kitchen you may not have noticed before. way first .... we all have one of these. The JUNK drawer. Where does all that stuff that migrates to the back of the drawer come from? And a second bit of ewwwww, but I wouldn't be without one. My trash compactor. 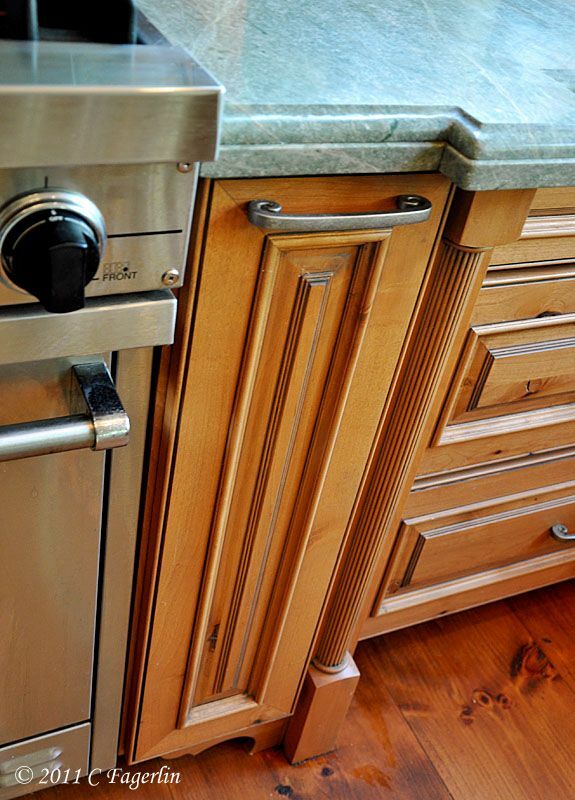 You might notice the design flaw ..... knobs that want to commit suicide by dropping into the contents of the compactor. I need to order another new knob. No, we aren't looking inside .... you DO NOT want to see what's in there! And just to get you oriented, a couple of oldies of the kitchen. Lazy Susan cupboards in either corner of the back wall. They hold a ginormous amount of goodies. 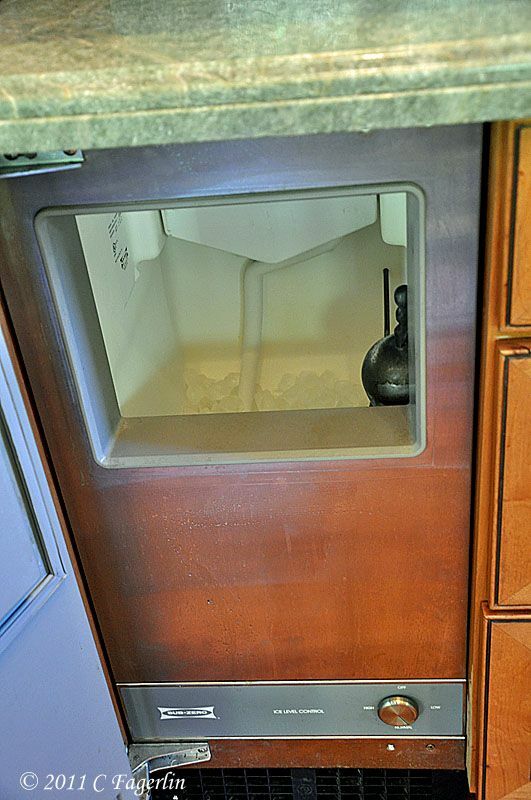 If you face a Sub Zero with wood, you need to open the door each time you want ice. So I planned for an ice maker .... oh wow, it's a tough choice between my antique pine cupboard I mounted on the wall and the ice maker. It's pretty much a tie for first place in the my favorite cupboard poll. An unlimited supply of ice ...... it's a favorite for sure! 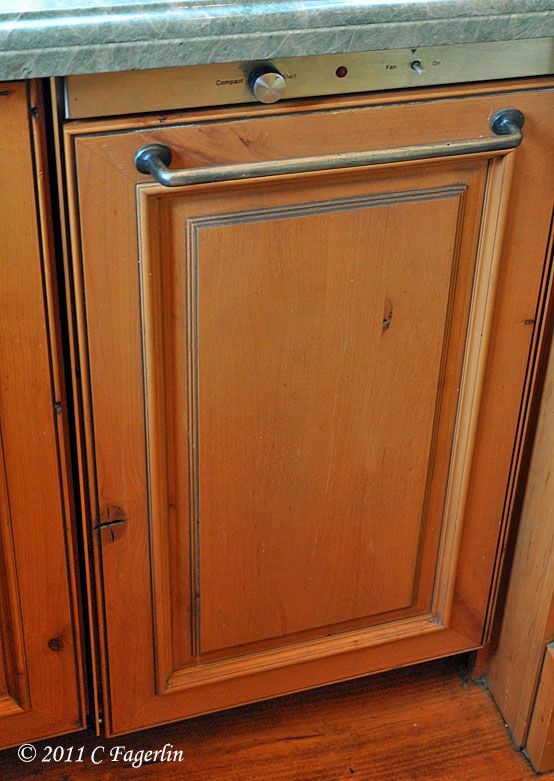 And before we move on to today's tablescape .... this really is my favorite cupboard in the kitchen. It's an antique pine top to a china cabinet that I've had forever. It has held books, dishes, dolls, and all kinds of things over the years. 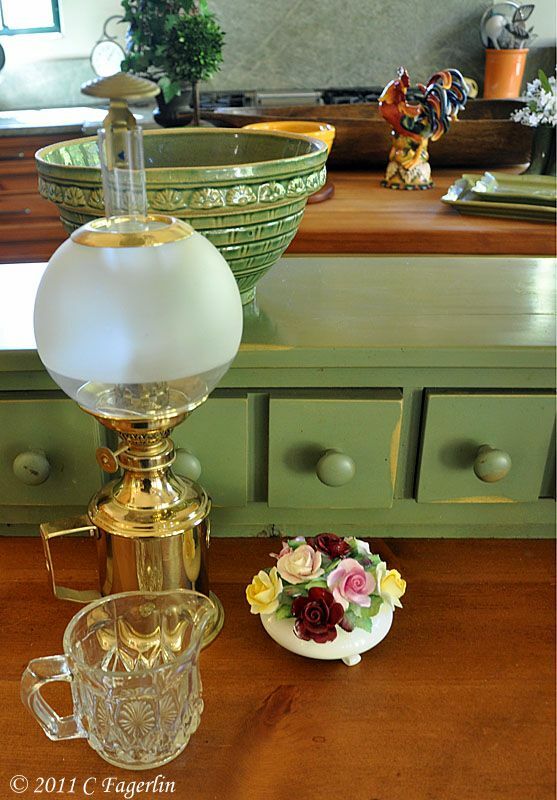 It usually sits on an antique pine side table, but this is my favorite way that I've ever used it. Not huge, but it holds so much stuff and makes it easy to see what I need to stock up on at Costco. Time to get back to The Little Round Table! 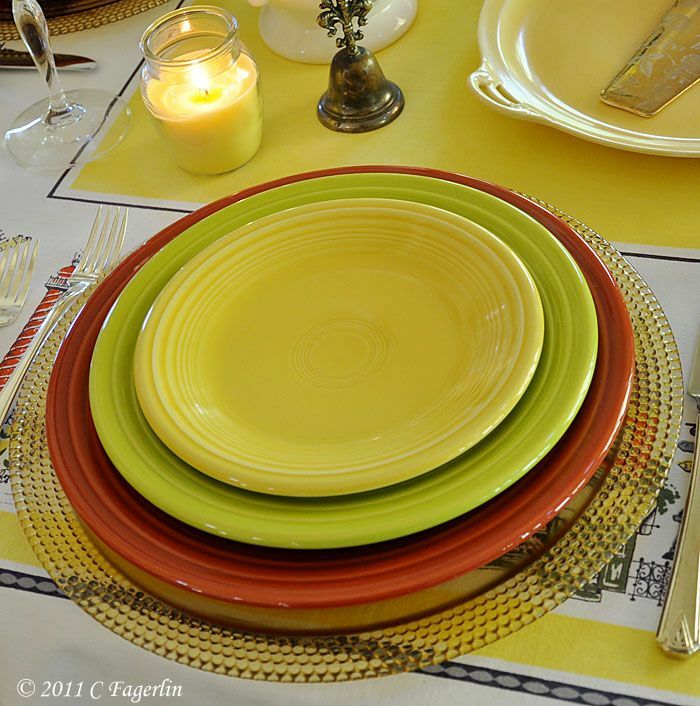 Today's tablescape is especially for my friend Daphne over at Tabletop Time. 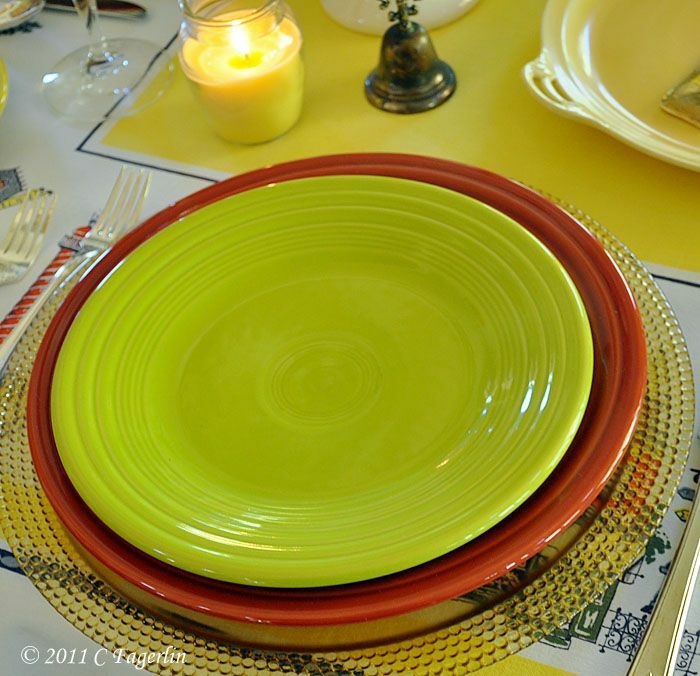 We are dish buddies as well as tablescaping fanatics and the oh so cute napkin rings on this table were a gift from D to me! 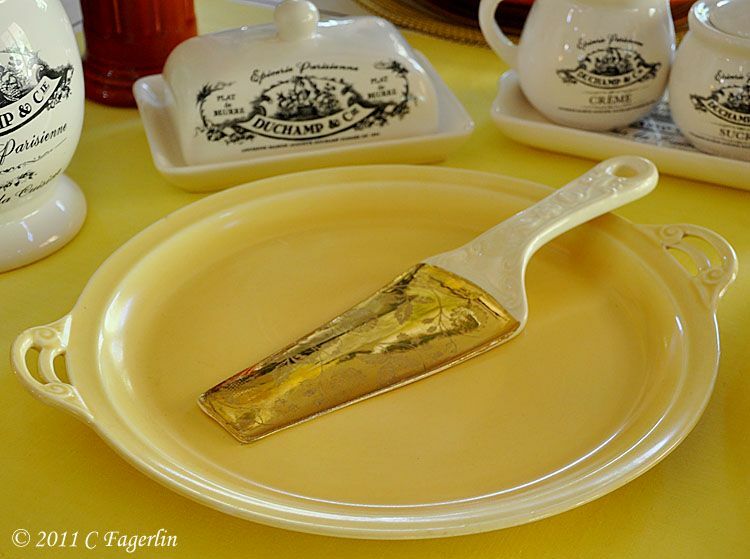 The icing on the cake for this little table about the Cafe D'or on the sidewalks of Paris. Details at the end of this post. 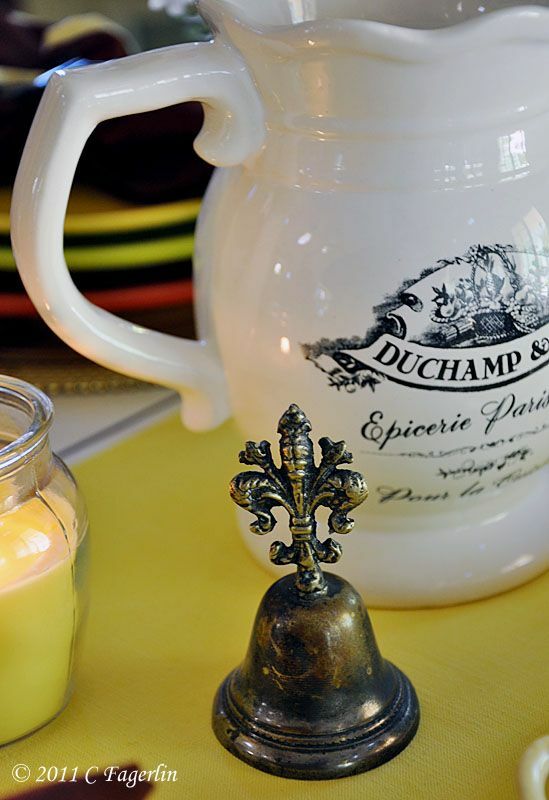 Duchamp and Cie pieces - Home Goods bargain! 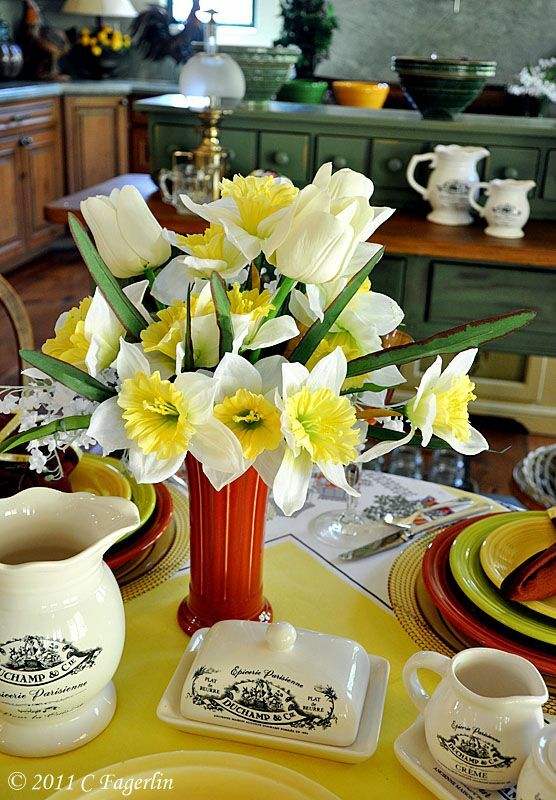 Thanks so much for stopping by for today's tablescape and mini-tour of my kitchen! Oh la la, Candy! 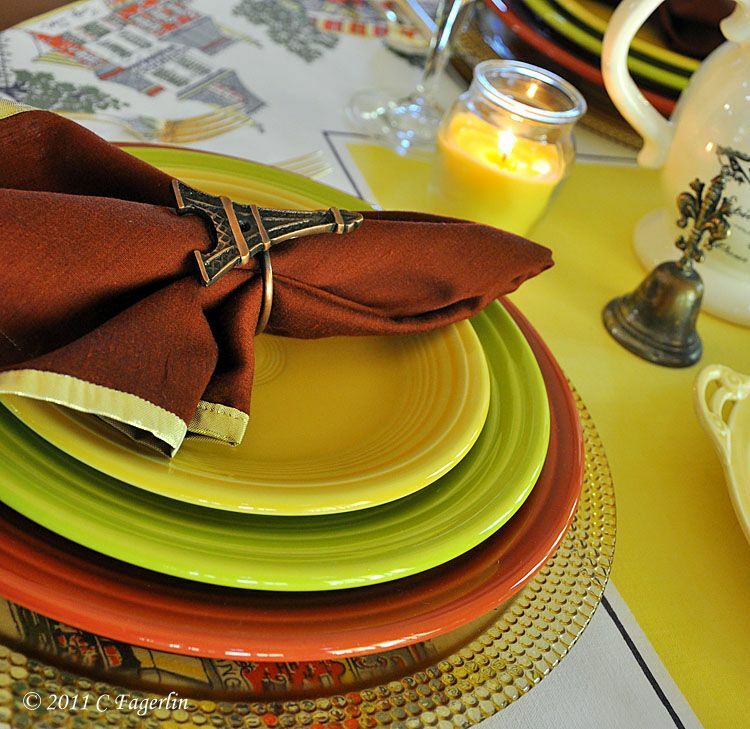 I've been looking forward to seeing this cloth in action, and your table is BEAUTIFUL! 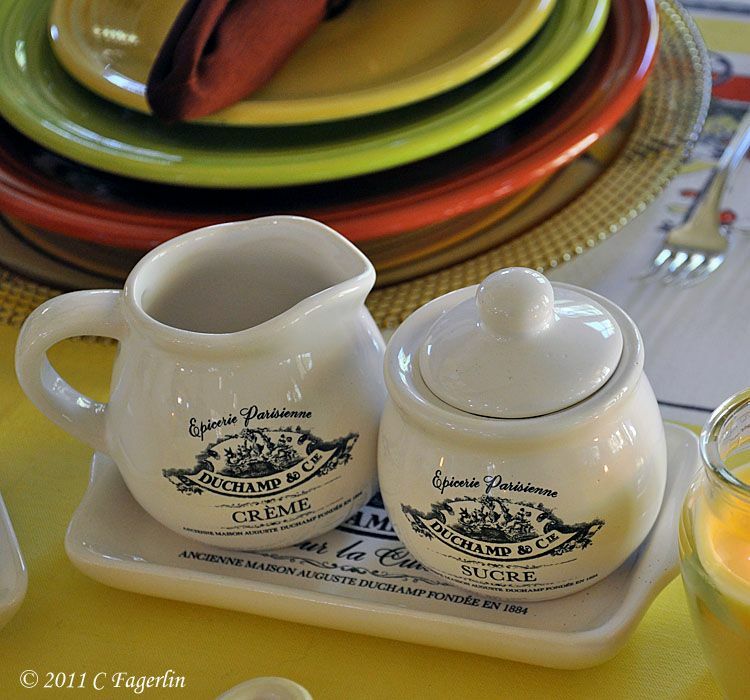 Merci for these warm cheerful colors of April in Paris...they are much appreciated on this gloomy day in New England! 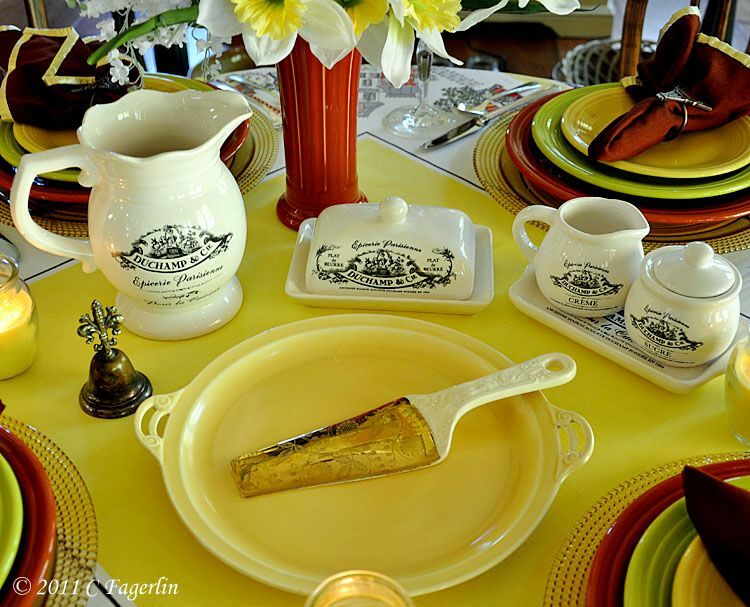 I hope my mansion in Heaven has a kitchen like yours...complete with the Fiesta ware!! 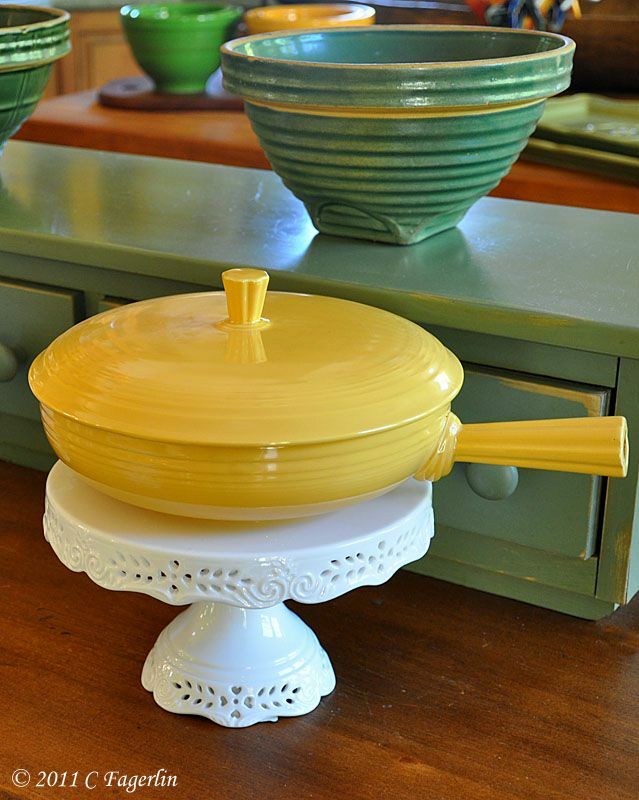 Hey Candy,it's always sooo "SWEET",over here at the little round table and your kitchen is heavenly. I had never seen your kitchen before, so I was astounded. Beautiful! 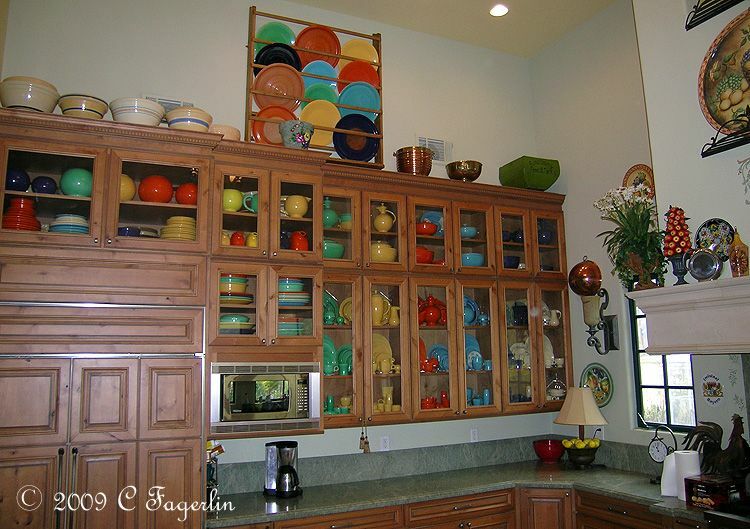 My favorite is the wonderful,creative way you displayed your fiestaware. I love your little round table but since I've never seen you kitchen before, I'm pretty speechless. It is just gorgeous. There is nothing I do not like about it. 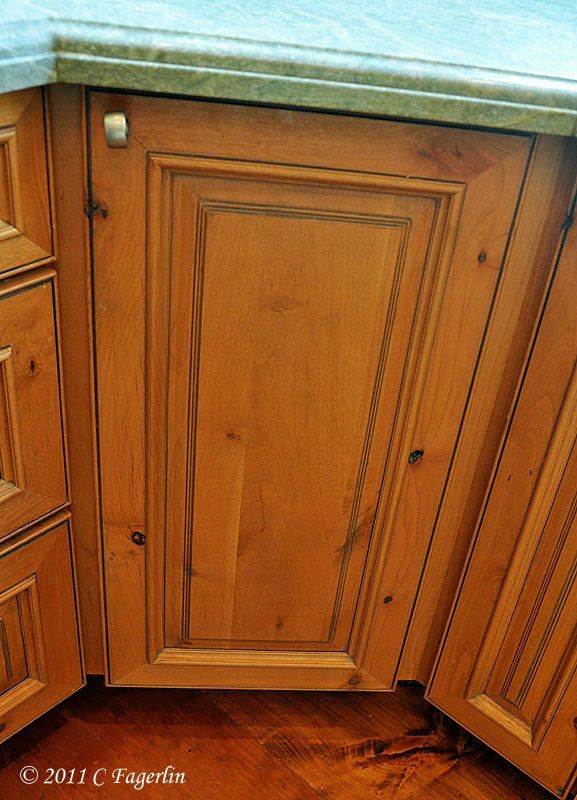 What type of counter tops are those? They are beautiful! Oh, Candy! I'm in kitchen heaven!! 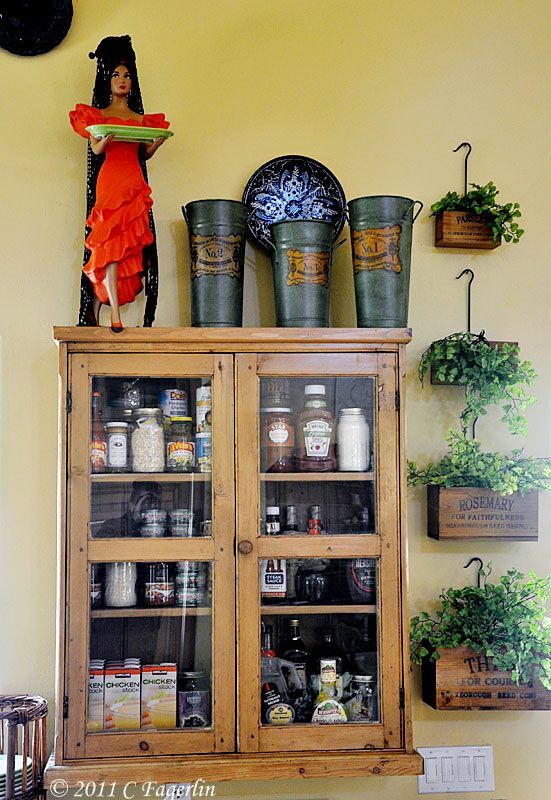 You know how I love your kitchen and I've loved seeing all your special little spots! 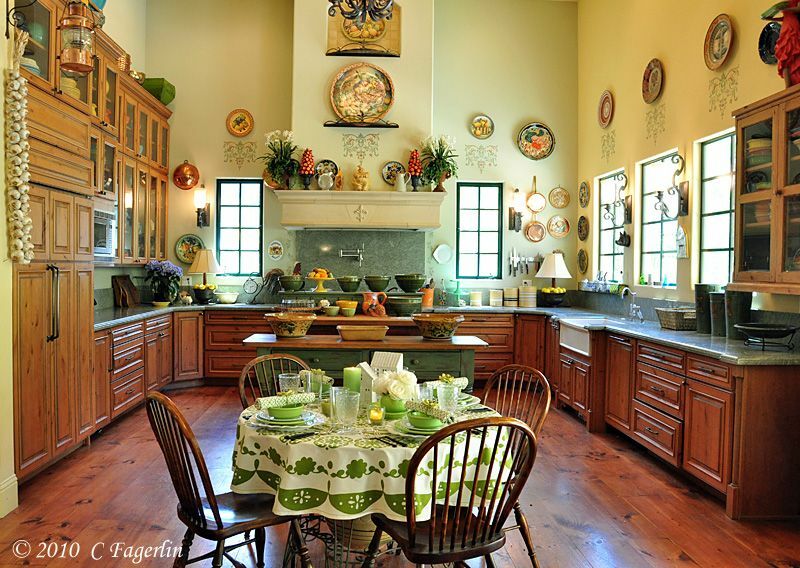 You have the most magnificent kitchen I've ever seen! 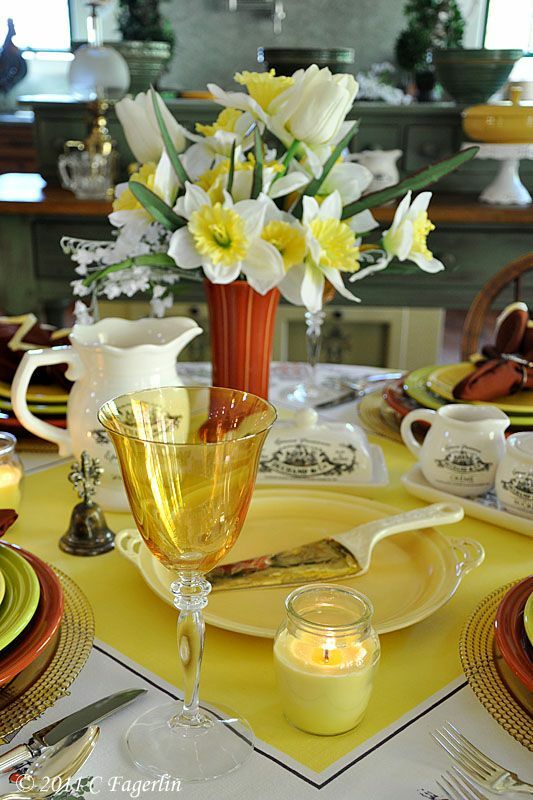 Your tablescape is just precious. 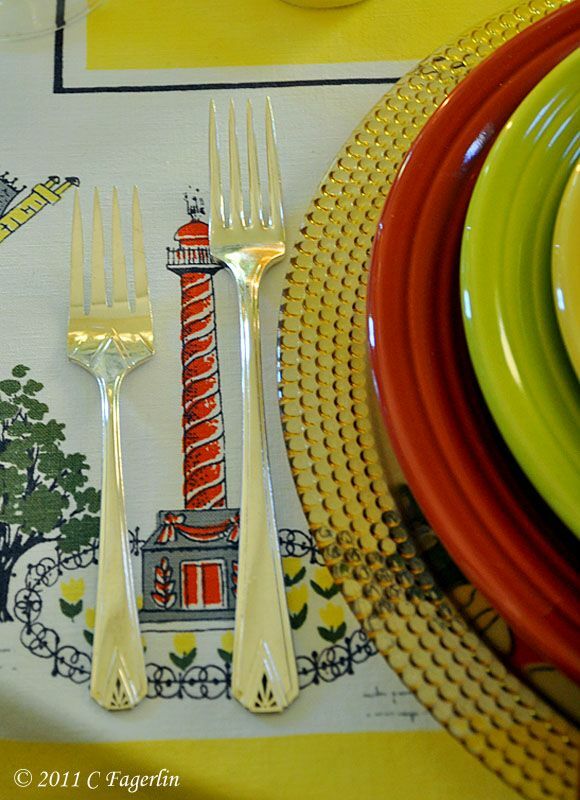 I love that tablecloth and of course your dishes - divine! Thank you so much for coming to my party!! I think your kitchen is just amazing!!!! 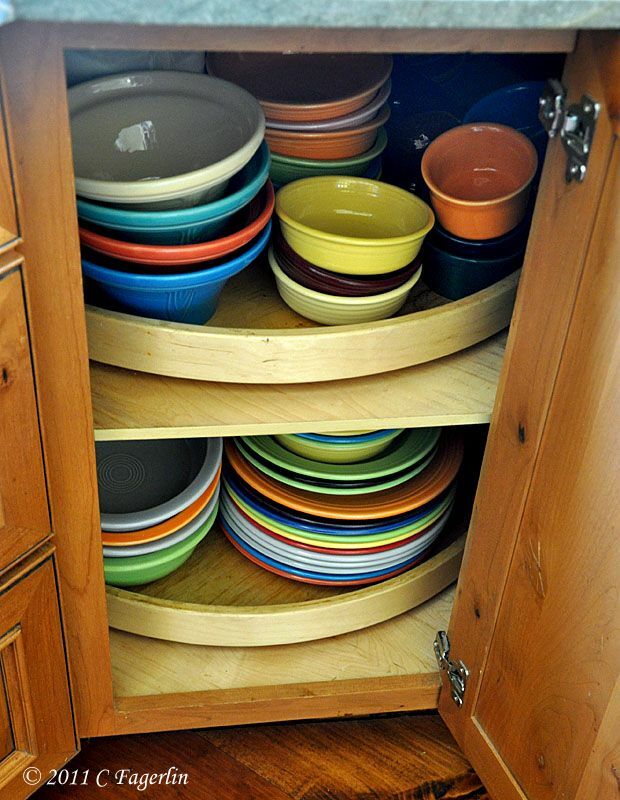 I don't think I've seen that much fiesta ware in one kitchen ever! It's the most beautiful kitchen I've ever seen! Congratulations. These images are very inspiring to me.Caroline, from Brazil! I would love to have your kitchen! Gorgeous and with such character!!!!!! 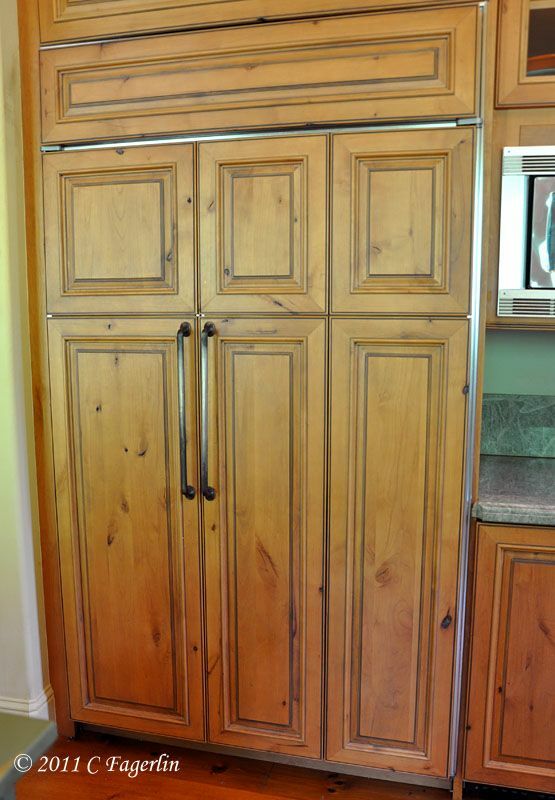 And your frig is over-the-top panelled! Oh I just love that. Your table is so happy and OOOOOh LLLLLLA LLLLLA! 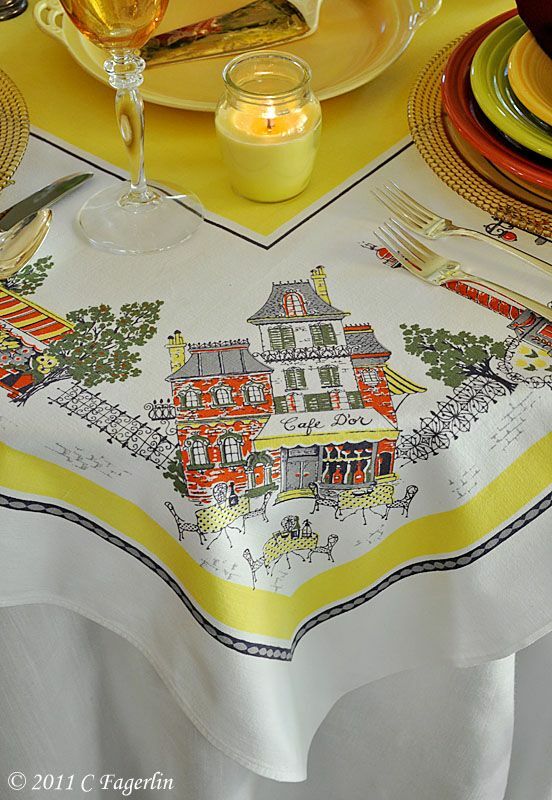 I think that tablecloth is my very favorite! 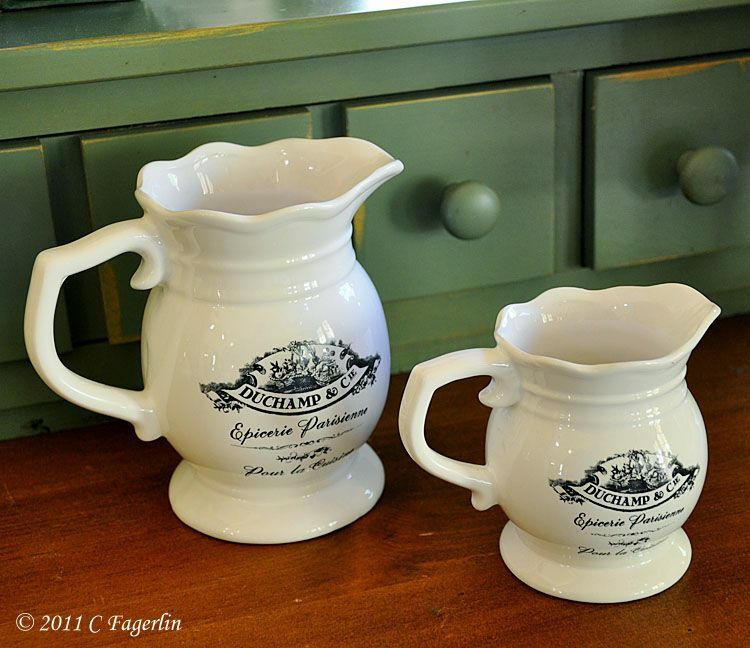 I am delighted that you gave us a tour of your BEAUTIFUL kitchen! 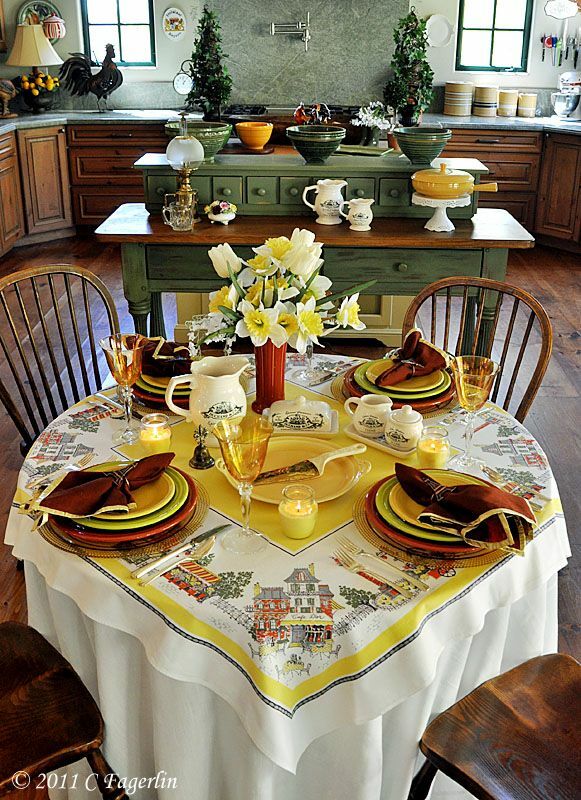 As usual I love your table.. but your kitchen is stunning! Wow.. 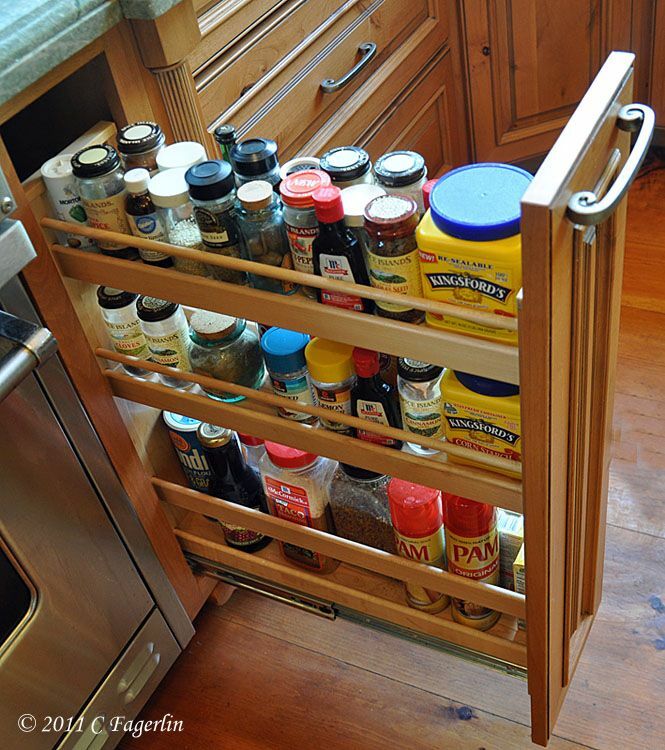 Your cabinets and the hardware are so pretty. 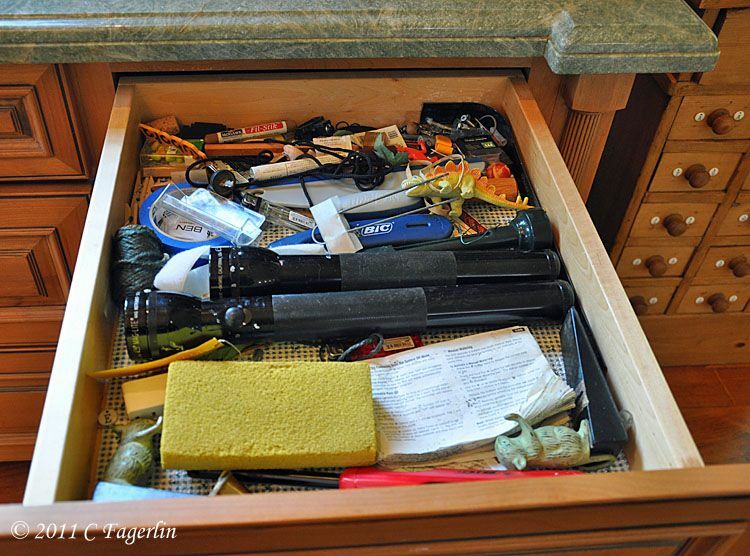 Your "junk" drawer is a lot neater than mine! Your kitchen is lovely! So, is the table cloth. 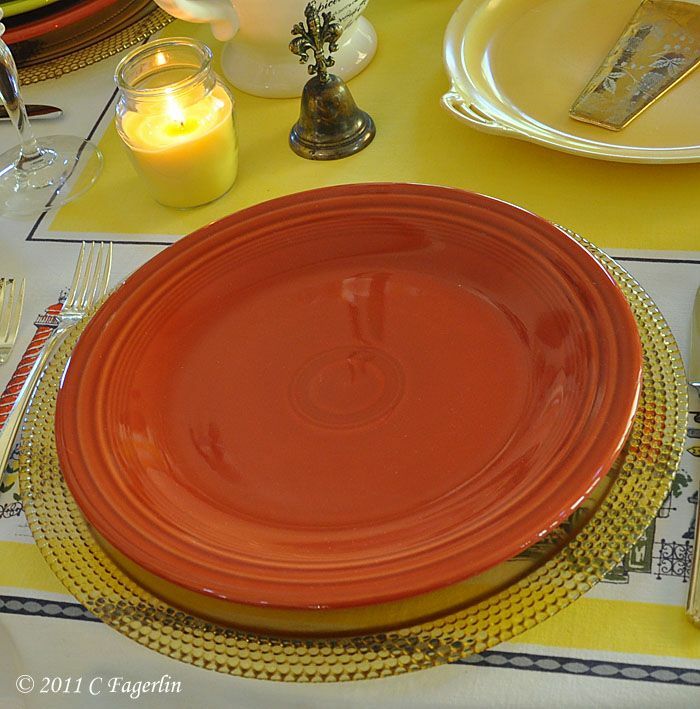 I like how you've combined the Home Good's French themed pieces with the more colorful plates. That gives me some good ideas. Candy, I never get tired of seeing your kitchen! It is stunning and I especially love your island! There's no way I'm letting anyone see my junk drawer! You're braver than I! Thanks for sharing. We never get tired of seeing your kitchen. We try to visit every day. It is our dream kitchen. 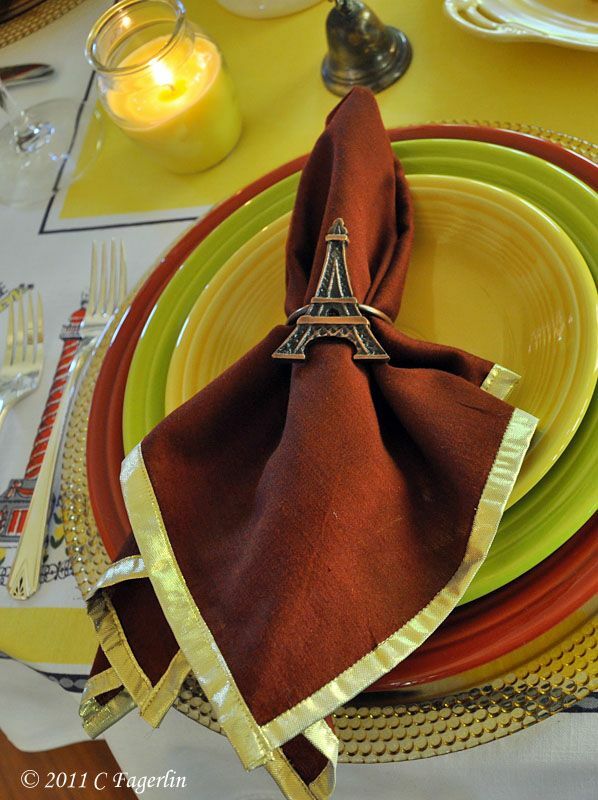 Your table is beautiful also. You always inspire us. Terrific!! oh my gosh!! I totally adore your collection.. Your kitchen is my dream.. my inspiration.. WOW!! Thanks to all of you for your nice comments and welcome to old readers and some new ones too! 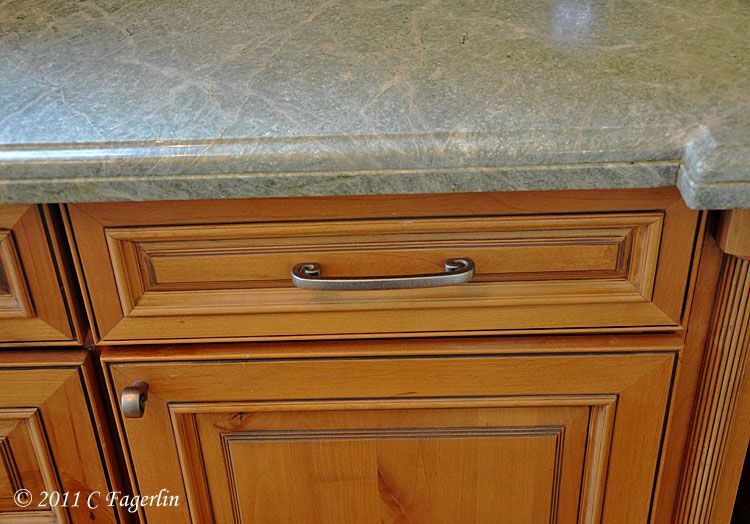 Marianne, the counter tops are granite slabs. 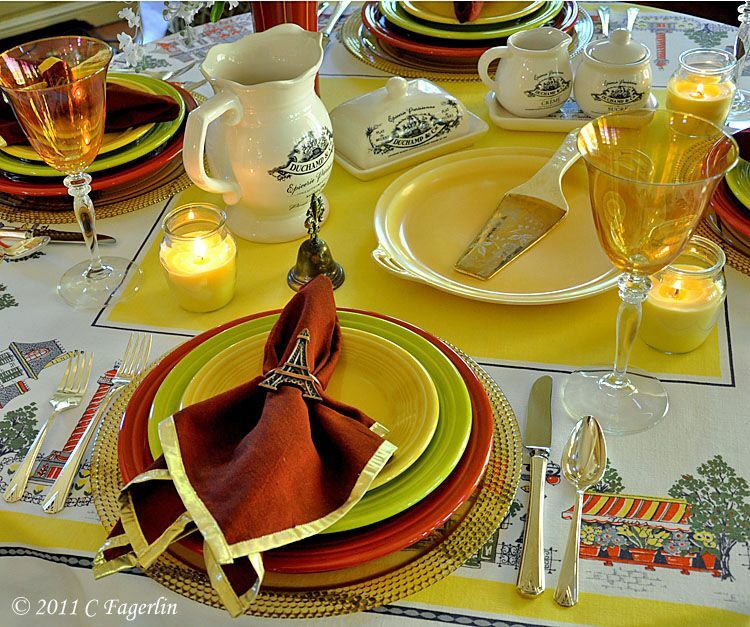 Love the tablecloth with the shopps on it. So pretty. I always enjoy my visit here. Thanks Ahrisha, I do appreciate your sweet comments.